Bottcher and his teammates — third Darren Moulding, second Brad Thiessen and lead Karrick Martin — fell behind 5-0 after four ends, but shocked Team Manitoba (2-1, West St. Paul) by scoring three in the fifth and stealing three more in the sixth. 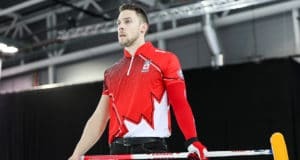 The comeback equalled the biggest comeback in Tim Hortons Brier history, and kept Team Wild Card in the thick of the hunt for berths in the Championship Pool. 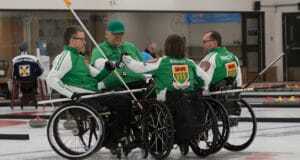 Northern Ontario is 3-0 in Pool A with Wild Card, Saskatchewan and Manitoba all at 2-1. McEwen called the game a “disaster” for which he and vice-skip Reid Carruthers have to shoulder the blame. McEwen, Carruthers, second Derek Samagalski, lead Colin Hodgson, alternate Matt Wozniak and coach Rob Meakin, appeared to have righted the ship with two in the seventh. They gave up one in the eighth and gave Bottcher a steal in nine to have the hammer in 10, a move that almost paid off. But McEwen’s last rock draw for two in the 10th ticked a guard, he had to settle for one and Bottcher used the hammer in the extra end to win. Brad Jacobs of Team Northern Ontario (3-0, Sault Ste. Marie) scored four in the seventh end to get by Martin Crête and Team Quebec (1-2, Saint-Romuald) 732. Kirk Muyres and Team Saskatchewan (2-1, Saskatoon) stole seven points in three ends early and beat John Likely and Team Prince Edward Island (1-2, Charlottetown) 9-2 in eight ends. Jon Solberg and Team Yukon (1-2, Whitehorse) beat Andrew Symonds and Team Newfoundland and Labrador (0-3, St. John’s) 8-4. The 2019 Tim Hortons Brier continues with draws today at 9 a.m., 2 p.m. and 7 p.m. (all times CST).